Approximately 6 in 10 eligible uninsured African Americans in the United States could obtain Health Insurance Marketplace tax credits, Medicaid, or the Children’s Health Insurance Program (CHIP). 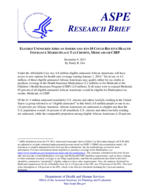 This ASPE Issue Brief discusses the demographics of the eligible uninsured African American population and new health insurance coverage options available to them under the Affordable Care Act. There are 6.8 million eligible uninsured African Americans nationwide, according to data from the 2011 American Community Survey Public Use Microdata Sample, and one-sixth of all eligible uninsured in the United States are African American. Under the Affordable Care Act, 2.2 million uninsured African Americans may be eligible for Marketplace tax credits and 2 million for Medicaid or CHIP coverage.